Do any of you remember Long Johns? No, not the underwear version. I am talking about the doughnuts. When I was young, my Father would always go to the local bakery on Sunday mornings and come home with a bag of doughnuts. There would be cinnamon twists, elephant ears, round jelly filled doughnuts and, my favorite, long johns. 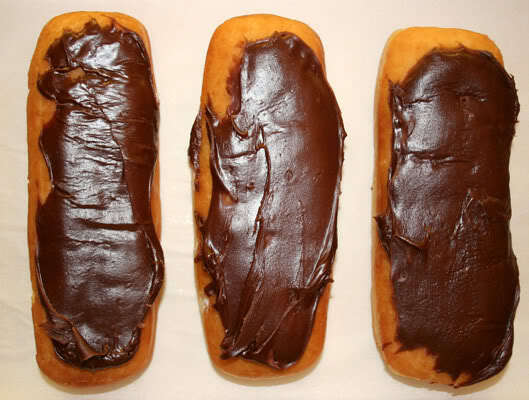 Long Johns are a cake-like doughnut with a pastry cream filling and chocolate ganache smeared on top. I adored them. Recently I got a request from a family member who was going to be here for the Labor Day Weekend. 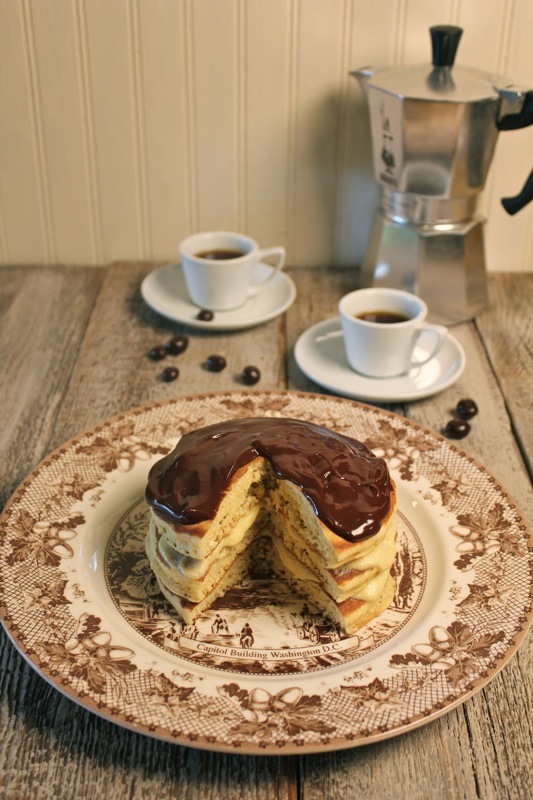 He asked if I would please, please make a recipe for Boston Cream Pancakes that he had seen online on the Country Cleaver website. 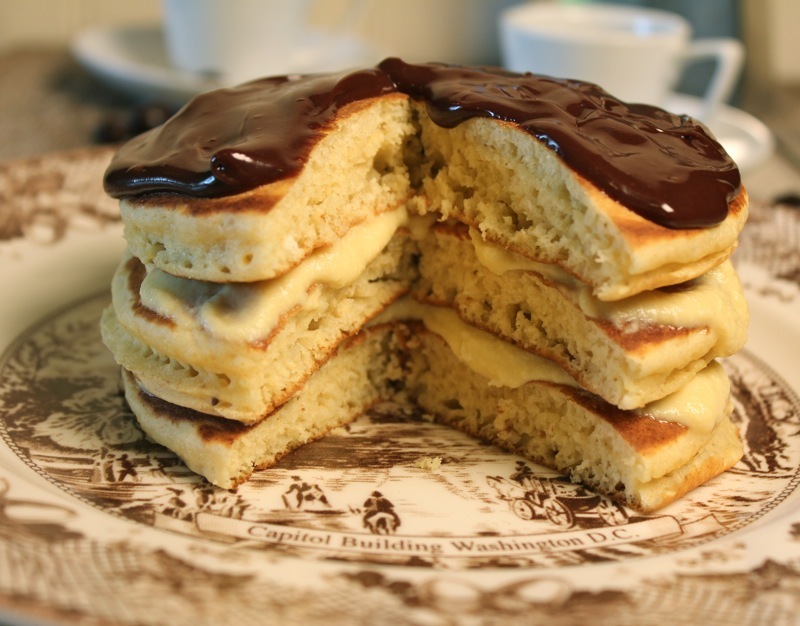 The pancakes are based on the Boston cream pie which was created by Armenian-French chef M. Sanzian at Boston’s Parker House Hotel in 1856. I made them for breakfast one morning during the Labor Day weekend but never got a picture because they were devoured so quickly. All I could think of when I ate them were those wonderful long johns that I had eaten as a child. 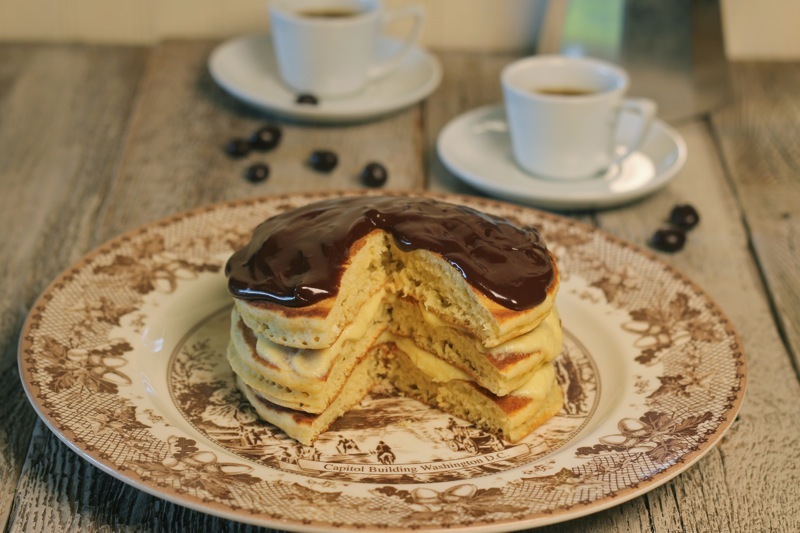 The fluffy pancakes, the smooth pastry cream and the decadent chocolate ganache all conspired to bring the flood of memories back. I tucked the leftover ganache and pastry cream in the freezer because I knew that they would be making a repeat performance in my kitchen. We had them for breakfast again on this beautiful Saturday morning, a day after my birthday. They were a welcome indulgence. Sometimes you just have to eat like you are a kid again and stop worrying about calories, fat and sugar and how old you really are. The pancakes themselves are an easy combination of yellow cake mix and Bisquick. They are light and fluffy. The pastry cream can be made way in advance and the chocolate ganache is easy. I would recommend these pancakes to you for any special occasion, whether it be for a birthday or just because it is a sunny day. Indulge! Posted on October 5, 2013 at 12:22 pm. There is a giveaway over at Girlichef’s blog. This month she is giving away a copy of Mark Bittman’s new book, The Food Matters Cookbook. To be eligible for the cookbook all one needs to do is blog about one of Mark Bittman’s recipes. To me that is a no brainer. I love all of Bitty’s ideas and recipes. I follow him every Wednesday in The New York Times. His philosophy is that what you eat matters both to you personally, and in the long run, to the health of the world in general. Eating seasonally means that the food you are eating is the freshest and finest that you can find. Eating locally means that small businesses and farmers are rewarded and will profit from their crops so that they will continue with their time honored traditions, as opposed to the practices of corperate farming. Eating whole grains instead of processed food will help our bodies remain healthy. Food really does matter and we have it in our power to make a difference. Take pancakes. I love pancakes. Most of the time I make them from scratch and I have felt good about it. But my pancakes are made with unbleached white flour. If I am going to the trouble of making a calorie laden pancake, I might as well boost the nutritional value so that it is better for me. Last Wednesday Bitty broached that very subject in The New York Times. His recipe for Cardamon-Scented Oatmeal Pancakes with Apricots and Almonds sounded delicious. We have been watching our calorie intake lately and we are trying to eat better. You notice I did not say we were on a diet. There is a difference. As a treat and a good way to start a lazy Sunday morning I made his pancakes. They were like no other pancakes I have had before. And because they were loaded with good things like oatmeal, crunchy almonds and dried fruit, I needed only two of them to be satisfied. Usually the maple syrup is there to make the bland pancakes taste better. These pancakes can almost stand on their own. But of course, I used maple syrup; just not as much. Mark Bittman recommends honey. I used cinnamon instead of cardamom because it was what I had. I also used dried cranberries instead of apricots. You can adapt them to your own taste. Enjoy. 1. Heat the oven to 200 degrees. Combine the flours, oats, almonds, baking powder, cinnamon and salt in a large bowl. 2. In a separate bowl, whisk together the egg and milk; stir in the cooked oatmeal and the cranberries until just incorporated. Add the oatmeal mixture to the dry ingredients and stir gently; don’t overmix. 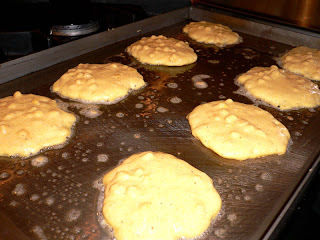 The consistency should be that of thick pancake batter; add a little more milk or whole wheat flour as needed. 3. Put a large skillet or griddle over medium heat. When a few drops of water dance on its surface, add a thin film of vegetable oil and let it become hot. Spoon out the batter, making any size pancakes you like. Cook until bubbles form on the top and pop, 2 to 3 minutes. Carefully flip the pancakes and cook until they’re browned on the other side, a couple of minutes more. You may have to rotate the cakes to cook them evenly, depending on the heat source and pan. As they finish, transfer them to a plate in the oven while you cook the remaining batter. Serve with honey or maple syrup. Yield 4 to 6 servings. My thanks to Girlichef and Alex of A Moderate Life, who was the brainchild behind the Tackling Bittman blog hop. Girlichef will be doing a round up of Mark Bittman recipes the first part of February and Alex will also be featuring his recipes on the Tackling Bittman Blog Hop. Posted on January 23, 2011 at 12:44 pm. I have been fixated with all things Thanksgiving this month. The flavors of cinnamon and pumpkin are to me the ultimate November flavor. We eat sensible breakfasts on most days of the week, but on Sunday morning I like to make something special. I have a griddle on my stove which I love. When we have lots of company I always make pancakes because it is easy to turn them out in a hurry. My basic pancake recipe was one from Martha Stewart, but there was something missing. My pancakes never turned out fat and fluffy. But my blogging buddy Sam of My Carolina Kitchen came to the rescue. She posted her favorite pancake recipe here and I compared it to the Martha Stewart recipe. The major difference was in the amount of baking powder. Sam’s recipe used twice as much. I tried her recipe and the pancakes were fantastic. Plus she tells you how to make your own pancake mix and has a dynamite recipe for blueberry sauce. With pumpkin and cinnamon on my mind, I adapted her basic ingredients into delicious pumpkin pancakes. They were great. Combine dry ingredients and mix well. Beat together the milk, pumpkin and beaten egg. Add melted butter. Add wet ingredients to flour mixture and stir until well combined. Do not worry about lumps. Add a little more milk if batter is too thick. Grease skillet and when it is hot add scoops of batter to skillet. Cook until bubbly on one side and flip pancakes. Cook until underside is browned. My next post will be from sunny Florida. We could not resist having a fire in the kitchen fireplace before we left. I will miss my kitchen. Posted on November 8, 2010 at 9:05 am. Last Summer, after months of renovating our Lake Lure cottage, we hosted a brunch for friends and the people who helped us with all of our improvements. These people had also become our friends. You can’t spend every day with people without coming to know them and feeling an attachment to their lives. We wanted to do something to thank them for all of their hard work and a late morning brunch seemed like a fun and relaxing way to accomplish this. I enjoyed doing it so much that I decided that inviting friends to brunch should become a regular occasion and I have come up with a menu and a plan that will make it easy for anyone to host a Sunday brunch without a lot of last minute preparation. I hope you will follow along with me. 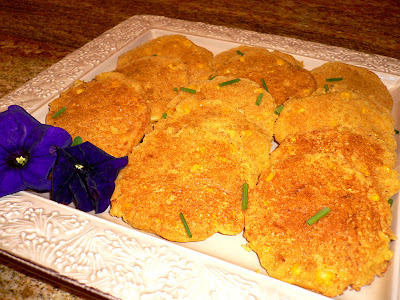 My first offering is corn cakes. 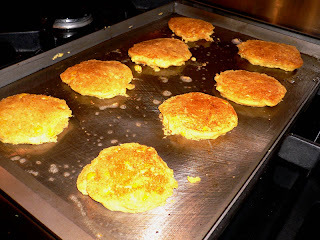 This is something a little different than the expected pancakes and they have the advantage of tasting fresh even after reheating, so you can cook them the day before your brunch and then rewarm them in the oven right before serving. You can eat them slathered with syrup and cut with a fork or pick them up and eat them like corn muffins. I enjoyed making these because I got to use the griddle pan on my stove for the first time. I adapted this recipe from Gourmet and it is so versatile that you can add anything that appeals to you. I fixed the basic recipe but you can add sauteed green peppers, onions, jalapenos, chives or jack cheese. You can serve the cakes with maple syrup or honey butter. In a bowl whisk together the cornmeal, the baking soda, the salt and the chives. Add the egg, 1 cup of the buttermilk, and 2 tablespoons of the butter and whisk the batter until it is smooth. Stir in the corn and let the batter stand for 10 minutes. The batter should be the consistency of thick pancake batter; if it is too thick, thin it with the additional buttermilk. Heat a griddle over moderate heat until it is hot, brush it lightly with some of the additional butter, and drop the batter by heaping tablespoons onto the griddle. Cook the cakes for 1 minute, or until the undersides are golden, turn them, and cook them for 1 minute more, or until the undersides are golden. Transfer the cakes to a heated platter and make more cakes with the remaining batter in the same manner, brushing the griddle lightly with some of the additional butter before cooking each batch. The cakes may be made 1 day in advance and kept covered and chilled. Reheat the cakes in a baking dish, covered tightly with foil, in a preheated 350 degree oven for 15 minutes. Makes about 16 corn cakes. Posted on May 20, 2009 at 11:20 am.